In a seizure during an outbound parcel interdiction, Counter Narcotics Alliance (CNA) agents seized a box of wine at the FedEx Tucson hub. 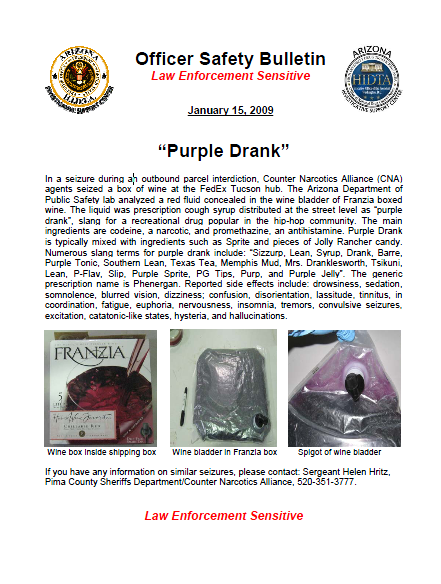 The Arizona Department of Public Safety lab analyzed a red fluid concealed in the wine bladder of Franzia boxed wine. The liquid was prescription cough syrup distributed at the street level as “purple drank”, slang for a recreational drug popular in the hip-hop community. The main ingredients are codeine, a narcotic, and promethazine, an antihistamine. Purple Drank is typically mixed with ingredients such as Sprite and pieces of Jolly Rancher candy. Numerous slang terms for purple drank include: “Sizzurp, Lean, Syrup, Drank, Barre, Purple Tonic, Southern Lean, Texas Tea, Memphis Mud, Mrs. Dranklesworth, Tsikuni, Lean, P-Flav, Slip, Purple Sprite, PG Tips, Purp, and Purple Jelly”. The generic prescription name is Phenergan. Reported side effects include: drowsiness, sedation, somnolence, blurred vision, dizziness; confusion, disorientation, lassitude, tinnitus, in coordination, fatigue, euphoria, nervousness, insomnia, tremors, convulsive seizures, excitation, catatonic-like states, hysteria, and hallucinations.